The classical cove router bit is an all-time favourite. The way shadows form when light falls on the final cut profile, makes this router bit profile really attractive. It is a great choice for projects like jewellery boxes, decorative mouldings and where an attractive edge profile is required. 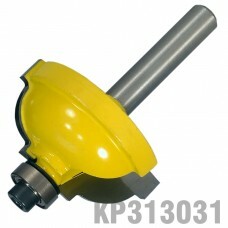 This two-flute router bit is well balanced, eliminating vibration that degrades the cut finish. This router bit has a 6.35mm shank (shaft) that will fit most small or large routers with the correct size collet. Please ensure that you select a router bit with a shank (shaft) size that will fit into your router collet.